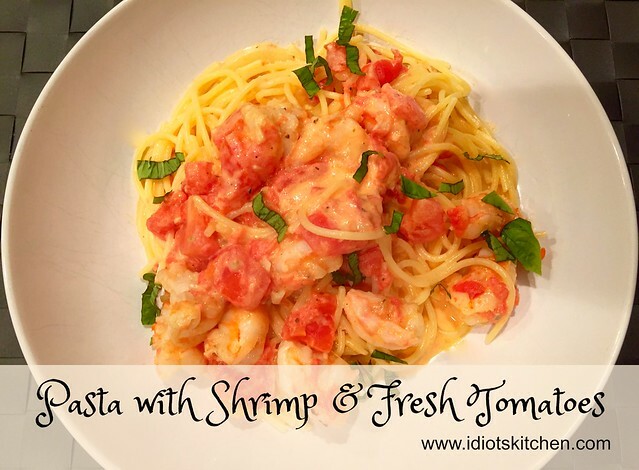 I can’t believe I’ve never posted the recipe for Pasta with Shrimp & Fresh Tomatoes! 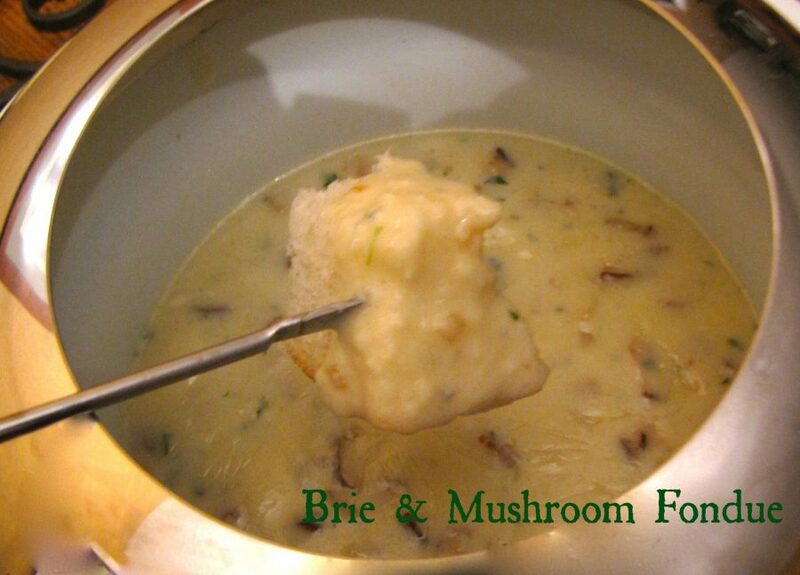 This has long been one of my favorite dishes to make but I often fiddle around with the recipe adding mushrooms, white wine, some kind of cheesy goodness, and I forget just how good the original recipe is. Pure and simple, quick and easy too…and totally beholden to good, ripe, summer tomatoes. 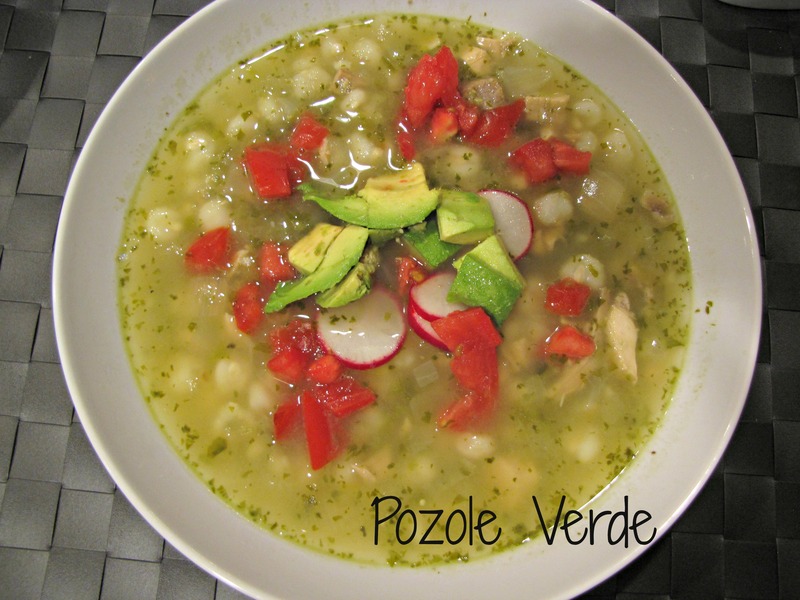 This is a recipe that can easily be on the table in under 30 minutes. Since we just passed the Labor Day Weekend, which is something of a second Ground Hog Day for those of us in Florida – Three More Months of Summer (gah! ), most of you with gardens are swimming in tomatoes. 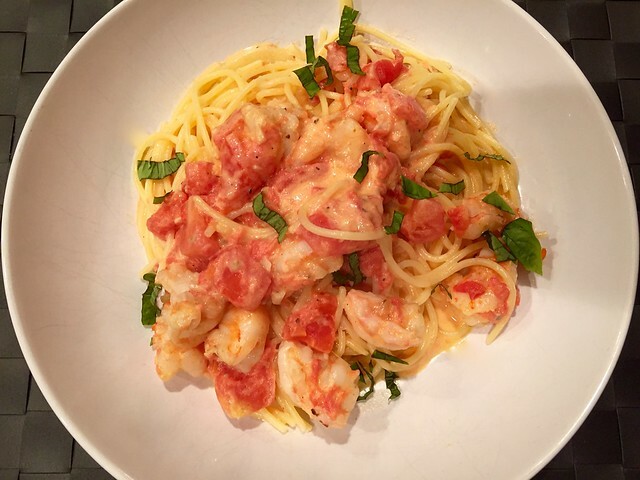 I think that’s a great problem to have and Pasta with Shrimp & Fresh Tomatoes is the answer! 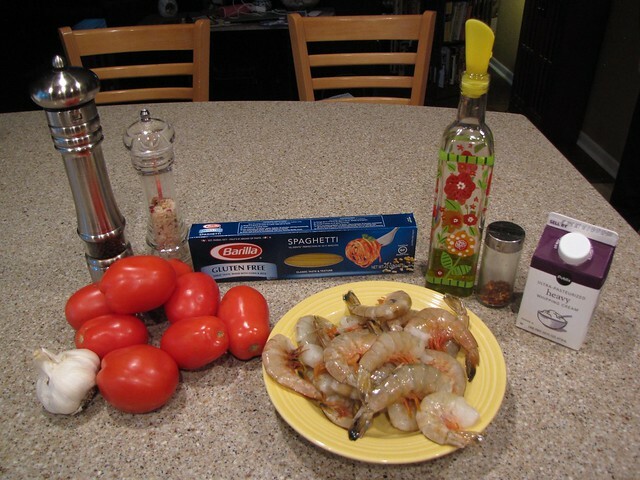 Shrimp, Tomatoes, Garlic, Olive Oil, Red Pepper Flakes, Heavy Cream, Pasta (Spaghetti or Linguine), Salt & Pepper. Pecorino Romano or Parmesan cheese for serving is optional and not pictured. Pick 2 pounds of fresh, ripe tomatoes for this dish. I have about 8 Romas because that’s the only thing that looked decent in my store. I’m afflicted with incredible garden and tomato envy this time of year. It’s not even funny the sad state of tomatoes in Florida. I have a whole rant on the subject but I’ll spare you. We want to scald the tomatoes with boiling water to remove their skins. 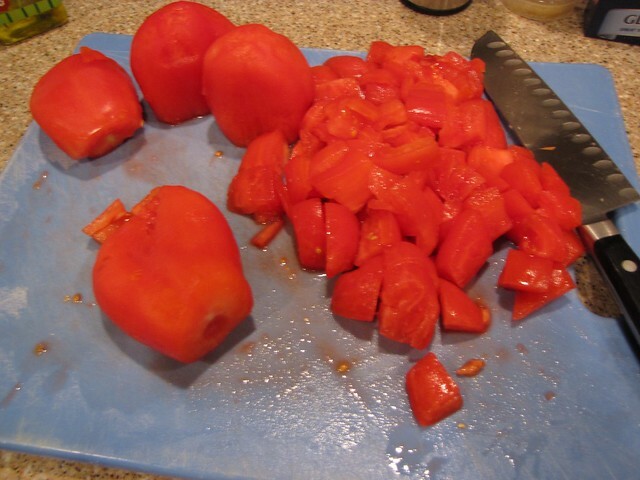 You can do this a couple of ways…first I cut an X into the bottom of the tomato just to make peeling easier. Then I like to fill my tea kettle with water and once it comes to a boil, pour the water all over the tomatoes while they’re in the sink. Stop part of the way through and turn the tomatoes over so you scald both sides. Let them hang out in the sink for 5-10 minutes and then start at the X and remove the peel. 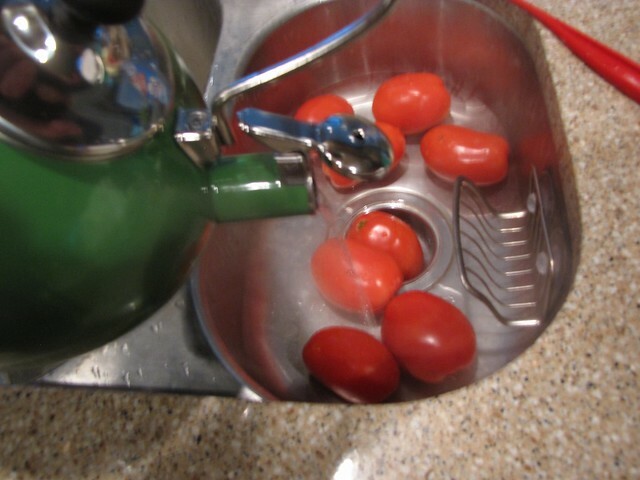 An alternative is to bring a large pot of water to a boil and dip the tomatoes in it for about 1 minute. Then let them rest and peel as described. Before you chop the tomatoes, cut off the ends and give each one a gentle squeeze over the sink or trash to remove as many seeds as possible. This keeps your sauce from getting too watery and also keeps the seeds from detaching and floating weirdly around your creamy sauce. Chop the peeled and seeded tomatoes into large dice – about 1 inch cubes. I like the tomatoes a little bigger so that the sauce stays chunky as it cooks. As I mentioned, this cooks quickly so it’s essential to have all of your ingredients ready to go. 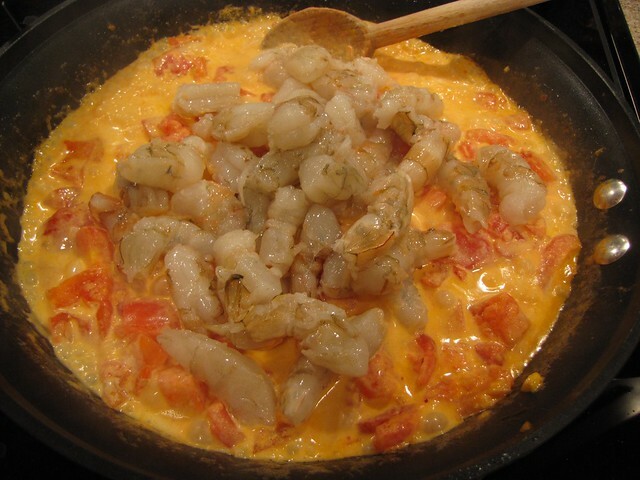 Peel & devein 1 pound of large shrimp and finely chop 2 nice cloves of garlic. Bring a large pot of water to a boil and drop in ¾-1 pound of thin pasta like spaghetti or linguini. My gluten free pasta comes in a ¾ pound box so I will have a little more sauce for my pasta than you would have using a full pound. I’m from a sauce loving family so that works out perfectly for me. 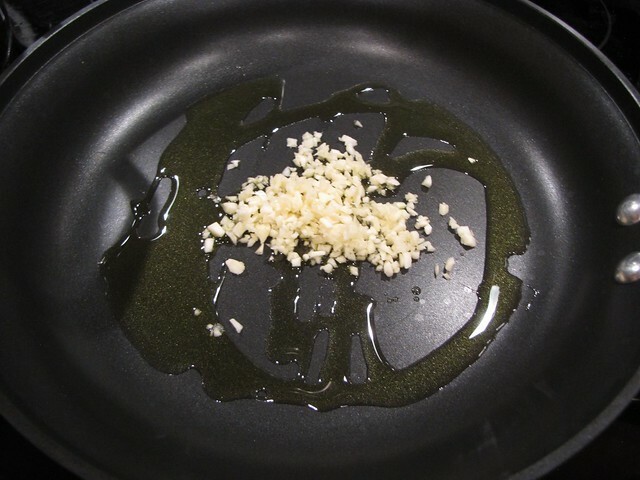 Heat 2 Tablespoons of good olive oil and the garlic in a large pan over medium high heat. 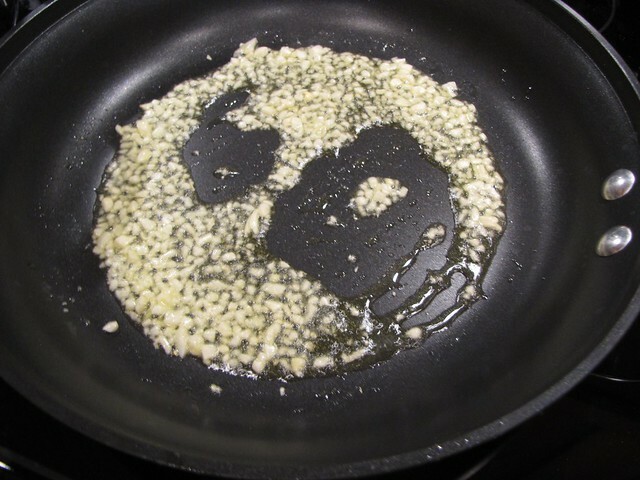 Sauté until the garlic just starts to sizzle, 1-2 minutes. Do not let the garlic brown or it will become bitter. 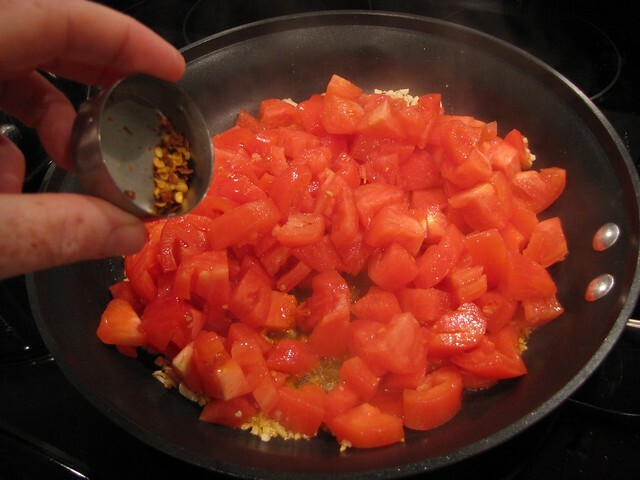 Add the chopped tomatoes and a nice pinch of red pepper flakes. 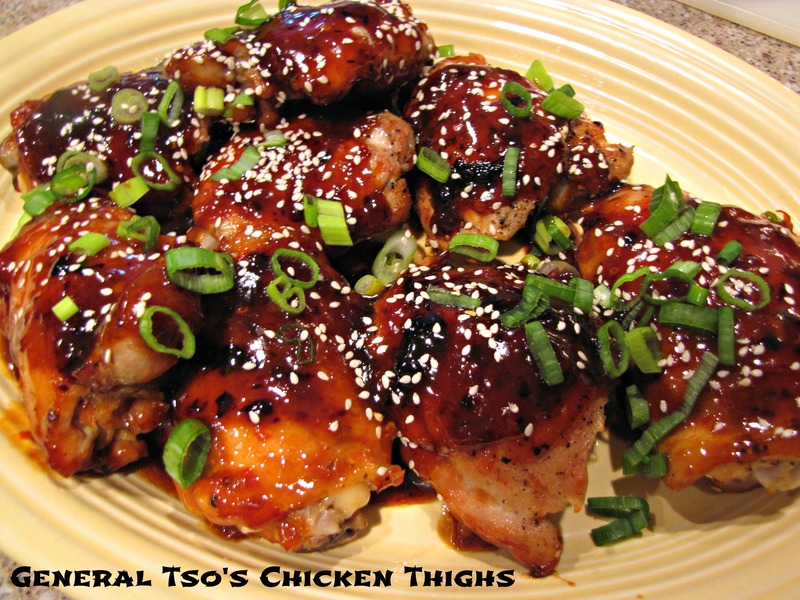 You can control the heat here but I think adding at least a tiny pinch of the pepper flakes really helps the overall flavor of this dish without making it spicy hot. 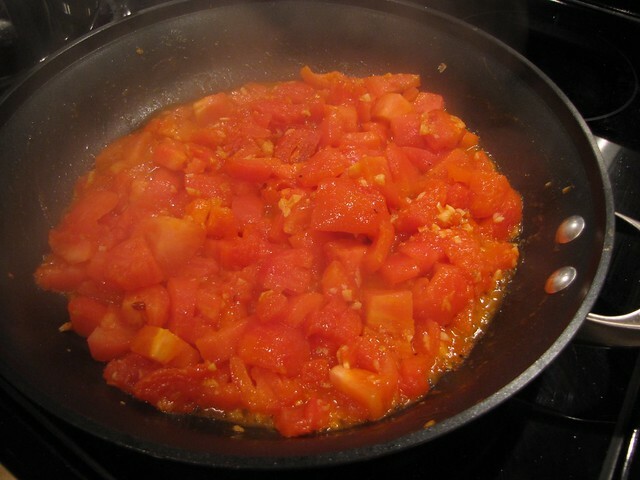 Cook the tomatoes over medium high heat until they just begin to fall apart and most of their liquid has evaporated. This should only take about 4-5 minutes. At this point, if you need to hold the tomatoes to wait for the pasta to cook, turn them down to low or even off. 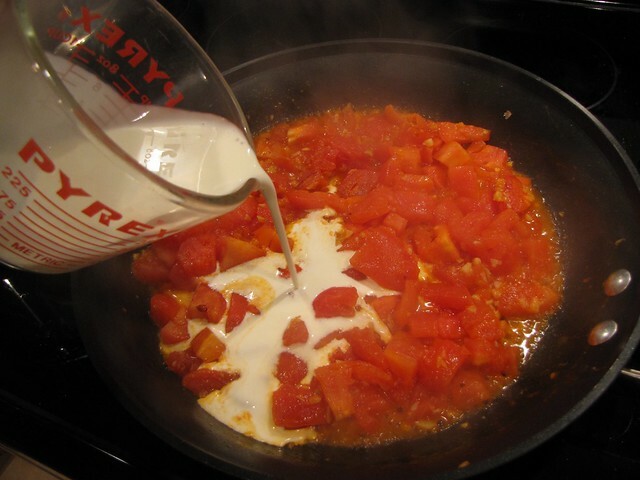 When your pasta is almost al dente, add ½ cup of heavy cream to the tomatoes and turn the heat back medium high. I like to use large shrimp (less peeling) and cut them in half so they are more bite sized. Add the shrimp to the pan and cook quickly until the shrimp are bright pink and the edges have just started to curl. The sauce should have also reduced nicely by that time. Add the cooked and drained pasta to the pan and toss to coat all of the noodles with the creamy sauce. 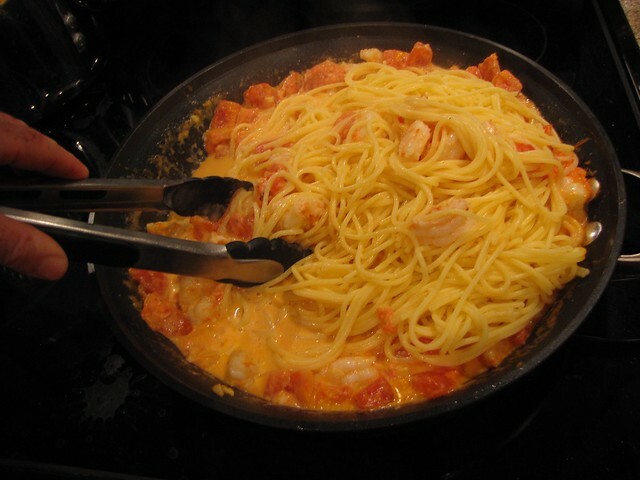 It’s easiest to plate up most of the pasta and then go back and add shrimp and sauce to each serving. I added a few bits of basil for color and because we’re also a cheese loving family, passed a nice wedge of Pecorino Romano for each person to grate onto their pasta as desired. Pasta with Shrimp & Fresh Tomatoes is a perfect late summer dish. Everything that is good and holy about a perfectly ripe, garden fresh tomato is highlighted in this simple recipe. Since it cooks in the time it takes to boil water and make pasta, this certainly qualifies as one of our Weeknight Wonders. I’ve also served this plenty of times to guests and I can assure you that velvety, creamy tomato sauce does not disappoint. 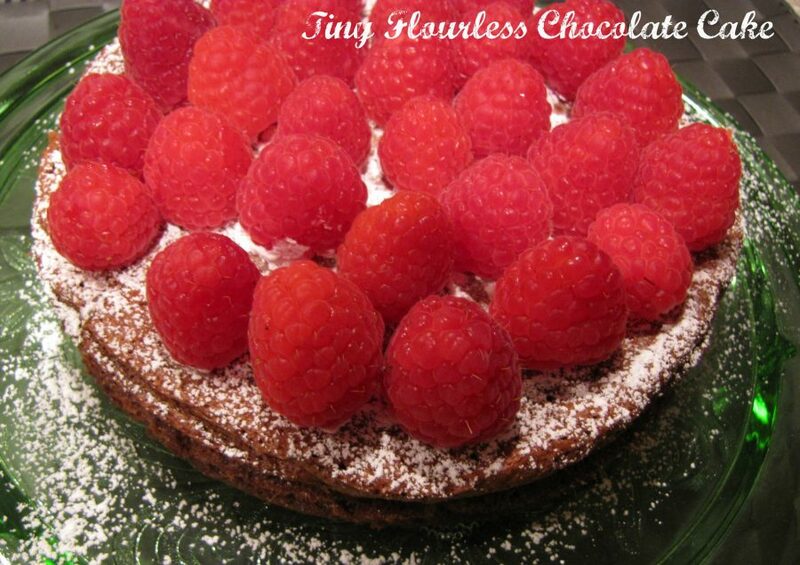 Nice nice nice recipe! I make this many of times, even without the shrimp! And I have to agree with you about the crummy Florida Tomatoes. They get shipped green from all over and sit in Publix Warehouse for weeks on end and ripen in there. Once you get them home, they rot in no time. Best tomato I ever ate here was from someone’s home garden in Long Island, NY! I am sure all of these Northern States have great Summer tomatoes once they ripen on the vine. How come none of your recent recipes include cat as an ingredient?